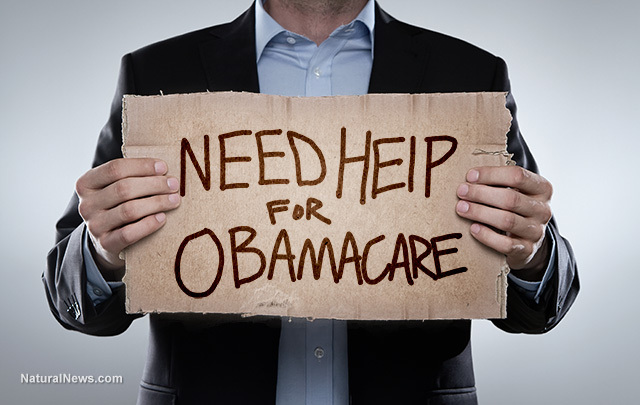 (NaturalNews) The failure of President Obama and the Democratic Party's health care "reform" law – Obamacare – is nearly complete, as insurance pools collapse, out-of-pocket expenses rise faster than consumers' ability to pay for them, and deductibles spiral through the roof. Breitbart News, in a recent report, listed five things that prove, beyond a doubt, that the president's "signature" law is falling apart – just like we said it would. Obamacare co-opts are falling fast: As noted by The Baltimore Sun, just six of the original 23 Obamacare co-opts are still operating. The other 17 have either closed or are in the process of closing because they are unable to attract enough members and earn enough premium coverage revenue to offset the massive regulatory costs associated with, and mandated by, the law. Skyrocketing premiums: Long gone are the days when candidate Barack Obama lied repeatedly about "working with" our employers to "lower premiums by an average of $2,500 a year." In fact, as Brietbart has reported, premiums are getting higher and higher, in some cases as high as 50-67 percent – just to keep insurers from bailing on state exchanges. Obamacare penalties are here: One of the "threats" made by the law was that, after a certain period, anyone who did not bend to the government edict to buy health insurance would be slapped with a penalty, issued by the 'beloved' IRS. They are here. Investors Business Daily reports that, in 2016, the Obamacare fine hit 8 million Americans, totaling more than $3 billion in penalties. First, Democrat-driven legislation forces you to buy an ever-more-expensive product (health insurance). Then the president lied repeatedly about how it would cost us less. And finally, the people are penalized when they don't buy something they literally cannot afford. How's that for "benevolent government?" Soaring deductibles: In millions of cases, the deductible amount for individual plans is so high the plans are essentially worthless. You'd have to be dropped out of an airplane and then get hit by a bus – and survive – in order to meet it. Otherwise, every other medical expense for the year, for average folks, is out-of-pocket. As Breitbart News noted, the Kaiser Family Foundation reported that 18 percent of covered workers in 2008 had deductibles of at least $1,000, up just 10 percent from 2006. By this year, however, 51 percent of all covered workers and 65 percent of workers in small firms have deductibles of $1,000 or more. The foundation reported further that workers at smaller firms have to pay "an average of $2,069 before insurance payments kick in..."
Even Bill Clinton thinks Obamacare is "crazy": Just days ago, the former president – whose wife, as the Democratic party's presidential nominee, has pledged to double-down on Obamacare - said the law is "the craziest thing in the world." And finally, the lord of left-wing media, The New York Times, has said "ailing" Obamacare law "may have to change" if it is survive. For long-time Natural News readers, none of this should surprise you. That's because on this site in May 2011, and at several points since, we warned that Obamacare was destined to fail. Its structure and economic model made failure inevitable. Even then, before much of the law had been fully implemented, costs were already beginning to rise. A hearing of the House Committee on Education and the Workforce subcommittee on Health, Employment, Labor and Pensions noted that employer-provided health insurance coverage costs were beginning to creep upward, with members citing several factors, "including the Democrats' recent government takeover of health care." Various small business owners testified before the subcommittee that the law had already begun to put economic pressures on them regarding health insurance coverage for their employees. "Every year we pay more and get less, and under the new law it appears that this process could get even worse," said Brett Parker, a finance officer for a small business in New York City. He added then that Obamacare failed to "rein in costs, and instead increased them, while loading job creators with mandates, regulations, new taxes and burdens."